Discussion in 'General Discussion' started by Famous when dead, Jan 28, 2019. 2: Morrissey’s re-issue of ‘The Last Of The Famous International Playboys’ features an image of Mozza and you backstage at Top Of The Pops.But which artist were you a replacement for? Morrissey’s cancelled his umpteenth recent UK tour, so now’s the time…. Fair play to him though, he's done well for himself. At least Rick didn’t go out of his way to denounce his photo with Morrissey as looking ‘sooo gay’ as if looking or being gay is a bad thing. TIM BOOTH SO MUCH TO ANSWER FOR. Exactly. From interviews I've seen of Rick he seems very down to earth. As for Tin Boots, him sticking his tongue out the side of his mouth was the gay-ist thing about that photo. Not sure if that's a word, but I don't like Tim Phonebooth slagging off that photo. I don't believe any of this is true until it is verified and commented upon by Skinny. Who would have been there. Totally enjoyed his last album. yip good guy,but whenever I hear NEVER GONNA GIVE YOU UP I feel like cutting off both my ears with a rusty hacksaw blade,apart from that,good guy. Didn't realise he is on the same label as Morrissey and James. The Hunk The Unc is everywhere getting his nose into it. NME interviewing Rick Astley, what a bunch of dilletante journalists ! I wasn't aware that it was Rick Astley on this picture. I didn't like his music back then, in the old days, and I thought Morrissey didn't dig his music either. But I might be wrong. 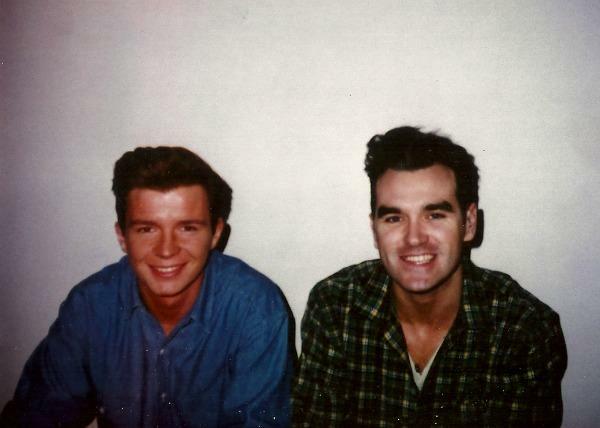 I doubt morrissey would have been a fan of Stock Aiken Waterman manufactured pop but Rick Astley did have a good voice and seems like a nice guy. He has a bit of a quiff going on in the twitter photo too. Yeah, that makes a lot of sense. They look good together. That snippet made me laugh, so I'll forgive him for inadvertently creating Rickrolls. And it is indeed a very nice picture!